About ten miles from Moscow’s inner circle, Sheremetyevo International is located on the northwest side of downtown, offering equal access into the city’s antiquities as much as the countryside’s wildness. Offering instant access to an express train as well as a slue of city shuttles through Mosgortrans, the modern facility makes it easy to get out of dodge. Look forward to everything that awaits by having a plan ready, whether it’s a free lift courteous of nearby hotels, like the chalet-style Atlanta Sheremetyevo, or a private ride you can call your own. Keep things close by knowing what’s ahead, starting with how you’ll enjoy yourself. Book a sedan to explore the city’s diverse history, from the north side’s historic Ostankinskaya District’s Television Tower to the Sokolniki District’s vast and ornate parklands. Bring the whole family with a roomy SUV, keeping track of all the quaint riverside activities, from Gorky Park’s 20th-century rides to the historic shops along Arbat Street. Get in touch with the community’s culture by seeing it through the eyes of a local, admiring the speedy route chosen by your taxi driver or taking the time to listen to a local personal driver instead. Keep in mind the opulence of lower Tverskoy by enjoying a night of luxury eateries and galleries with the grace of a limousine, each meet-and-greet coming with your own chauffeur. Find other destinations that offer GO Airport Shuttle or search for other transportation providers at Sheremetyevo SVO airport. In Sheremetyevo International Airport there are available airport shuttle services. These companies provide easier, faster and cost effective in booking certain ground transportation from the main airport. Professional drivers are provided in which they will take every passenger to their desired destinations. It can be from your neighborhood or even to the local airports as well as to the hotels where you are staying. These airport shuttle services are indeed helpful and convenient for every passenger or tourists coming to Russia most especially in Sheremetyevo. Sheremetyevo International Airport is indeed an international airport complete with every single thing you need while you are traveling around the world. Travel with one of our shared ride vans and get close to nature. It is a perfect way of spending your day while in this area. If you do not like traveling with a couple of strangers, we have the private vans to get you to any destination such as the Temple of The Resurrection. Our private sedans provide amazing airport transfers. They will cater for literally all your airport transfer needs from or to the Sheremetyevo International Airport. We offer local personal drivers to travelers who may need to get to various interesting locations like Stadium Otkrytie Arena and any other exciting place. If you are a religious person, there is the Church of the Assumption of the Blessed Virgin for you to visit in a private SUV that we will provide. If you brought your camera on your trip to this region, then you have got to travel to Sculpture Bread and get a shot at the stunning sculpture. The best way to travel is through our taxicab services. For those traveling with a couple of kids, you should get a stretched limousine and head on to Culture and Leisure Park of Lev Tolstoy for some fun time. Spend a day picnic at the Park of Maria Rubtsova. You can get here easily by hopping on board one of our buses. Get to your families and friends quicker as you make your way around the airport to your awaiting driver. Sheremetyevo International Airport is one of the major airports in Russia along with Domodedovo and Vnukovo International Airport. This is located at Khimki, Moscow Oblast, northwest part of Russia’s capital and is at the second spot as Russia’s largest airport next to Domodedovo. It is capable of handling millions of passengers up to 20 million and even thousands of aircraft movements. The Sheremetyevo International Airport is complete with offices providing currency exchange and banking services to all travelers. There are also scattered ATMs available in both of the areas of the arrivals as well as the departure area. The airport has an array of numerous cafes, bars and restaurants such as the Club Bar known for teas of Ronnefeldt and delicious decent pancakes. There is also the Soviet restaurant with retro- chic theme providing a stunning view of the beautiful tarmac. When it comes to communication, the airports specific facilities are offering free wireless Internet access. 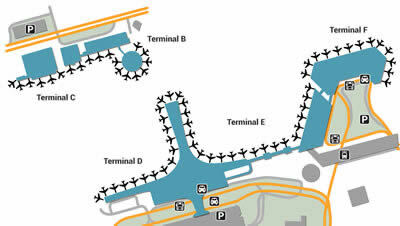 Numerous shop selections are available mainly located at the four major terminals of the airport. These include gift shops, outlets of duty- free, newsagents as well as pharmacies. For disabled individuals, the airport is providing wheelchair transfer, special assistance, Internet facilities; disabled toilets are given to them. They are also provided with parking spaces, which are free once booked as soon as possible. Other facilities include car parking and car rental. The Sheraton Moscow Sheremetyevo Airport Hotel is known for its restaurant serving delectable cuisines of Russia as well as other European dishes, this is the Voyager. Another is the East37, which is a "Pan Asian" restaurant. It is offering fast wireless Internet connection for free and shuttle service going to or from the terminals of Sheremetyevo terminals. The Atlanta Sheremetyevo Hotel will only take you 12 minutes ride to reach the hotel from the main airport. It provides free transfers for the guests. It is compete with well air-conditioned rooms, free wireless Internet, Russian Sauna, restaurant and bar. The Best Western Premier "MONA" Boutique Hotel can be reached within 40 minutes ride for it is only 15 km away. It is equipped with stylish, comfortable rooms including buffet breakfast. It also offered free wireless Internet as well as services for dry cleaning as well as laundry.